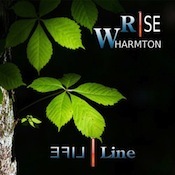 Charging out of the gates fueled by high-octane electro-funk, Wharmton Rise’s Life Line is a quick shot of five uptempo toe-tappers that race by in under 30 minutes, leaving just a big wash of euphoria in their wake. It’s tasty electro-pop with a slight old-school edge, and it’s pure fun. “Avatar” puts me in mind of George Duke as it opens the disc with a meaty bass line and a jazzy attitude. Andrew Mark Lawlor laces a nice drop into this one, switching up the feel for a minute or so before he brings it home. “Disturbance” is about as close to club music as I’ve heard Lawlor get. The beat thuds along over a chugging rhythm and floaty melody. This one has a tasty 80s synthpop vibe to it, and begs for extra volume. It leads into the title track, an angular, robotic thing with something of a late-Kraftwerk edge to it. (I am also reminded of some of Sensitive Chaos’ work here.) “The Park” is my favorite piece on Life Line. It opens with twinkling keys and string pads. Piano comes in and the piece becomes a smooth blend of New Age and electronic–with a rimshot-driven lounge beat and another tasty bass line to hold it all down. “Recollections” follows suit, a lightweight piece of ear-candy with a cool groove to it. Lawlor closes the release with “Titan’s Rhythm.” Clocking in at under three minutes, it’s almost a toss-away track compared to the rest. Throbbing chords pair up with high pads, bringing echoes of Oldfield’s Songs of Distant Earth to mind. It seems to end right about the time it wants to get more interesting. Life Line, as I said, is a fun release. It’s got energy to spare and its clean, edge-of-retro sound is easy to latch onto. Lawlor’s definitely in his comfort zone here and it shows. A short ride that’s definitely worth taking.